March continued to be a decent month for cannabis stocks supported by rising equities market and investor risk appetite. U.S. cannabis stocks posted better performance due to a slew of positive earnings and consolidations that sparked investor optimism. Canadian cannabis companies struggled in the face of disappointing earnings from industry leaders such as CannTrust and Cronos. In this series, we discuss the extreme price movements of the month. You can check out the best and worst performers of February 2019 here. Charlotte's Web (OTCQB:CWBHF): The first stock we wanted to highlight is this hemp-CBD player which has gained 35% last month. We think the stock benefited mainly from several positive developments within the CBD industry. As we predicted in "Charlotte's Web: 2 Potential Catalysts", gaining access to national retailers would become a positive catalyst for the stock which is exactly what happened last month. CVS first announced that it will start carrying CBD products nationally which was followed by Walgreens in a similar announcement. 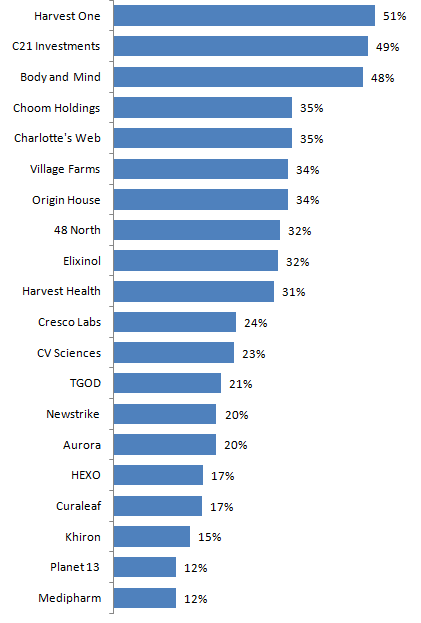 Based on social media posts, Charlotte's Web has been identified as one of the select few brands on the shelves. Going forward, we think Charlotte's Web is well-positioned to capture a large share of the multi-billion dollar industry with everything CBD-related. The stock has appreciated significantly but we think there remains upside once the company uplist to a major stock exchange. Furthermore, we think Charlotte's Web has the potential to begin exploring international opportunities including Latin America where its brands are already well-recognized and among some of the most sought-after CBD products by locals. We remain confident in this stock and believe it is positioned to benefit from a positive secular trend towards accepting CBD as a wellness ingredient. Harvest One (OTCPK:HRVOF): This small-cap player enjoyed quite a run in March propelled by its agreement with Shoppers Drug Mart, one of the largest pharmacy and convenience chains in Canada, to supply medical cannabis. While we think the agreement will bring limited benefit to Harvest One due to the fact that Shoppers has signed a number of suppliers a few years ago and Harvest One will most likely represent a tiny part Shoppers' overall cannabis supply. However, for a tiny cap stock like Harvest One, any positive newsflow could result in significant volatility in the stock. Going forward, we think Harvest One remains too small to stay competitive in Canada where consolidation has created a number of large players. For small companies like Harvest One, an oversupply could be devastating as it lacks the cost advantage and resources to weather a period of downturn. We remain on the sidelines on this one despite a strong rebound in March. Other notable movers include Choom Holdings (OTCQB:CHOOF) driven by its announcement to potentially enter the New Jersey market through a potential applicant (very preliminary in our view). Origin House (OTCQX:ORHOF) gained 34% and has announced that it will be acquired by Cresco Labs in a no premium all-stock deal. Village Farms (VFF) was one of the best performers last month and has continued its impressive run. Liberty Health (OTCQX:LHSIF): This Florida-based medical cannabis firm lost 18% last month and became one of the worst performing stocks among our list of coverage. The main reason for Liberty's underperformance was the leadership changes that left the company searching for new directors and management. After Hindenburg Research released a report alleging Liberty of certain insider dealings and overpaying for certain assets, the company has announced that its CEO, CFO, and certain Board members have resigned to make room for local talents. Looking ahead, we think the recent stock weakness and leadership void created uncertainty and opportunities for investors that have a medium to long-term horizon. The company is executing well in Florida and now operates 11 dispensaries making it one of the largest local players. We also think Liberty could become a takeover target for others looking to enter Florida - there are only 14 licenses in Florida currently. Wayland (OTCQB:MRRCF): This stock was one of the worst performers in February when it lost 21%. The stock again became one of the worst in March as many of the risks we recently highlighted became reality. As we warned, the company was facing a cash crunch and it had to turn to alternative capital sources. The company has issued $20 million of convertible debentures to Alpha Blue to help meet its near-term obligations but it had to issue millions of warrants to compensate the investor. While these warrants are out of money due to the significant decline in Wayland's share price, the debentures are convertible into common shares after one year. Looking ahead, we don't think Wayland is investable at the moment due to the significant cash burn at its Canadian operation and a 50% sale of its international assets to ICC that has been delayed. We would stand on the sidelines until the company begins to execute. Overall, March was another good month for cannabis stocks as the sector benefited from a supportive equities market and rising risk appetite among investors. The U.S. cannabis companies generally outperformed Canadian companies as a wave of consolidation is pushing these U.S. companies much larger, in certain cases rivaling some of the largest Canadian companies. 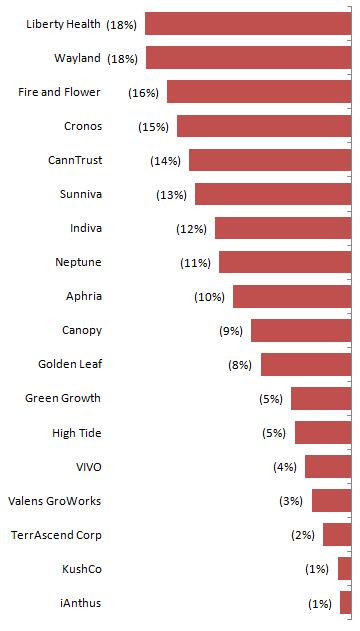 Most of the Canadian large-cap stocks declined after a stellar beginning in 2019 as earnings disappointed in certain cases, such as CannTrust (CTST) and Cronos (CRON). Going forward, we think the U.S. stocks will continue to enjoy a positive trend towards consolidation and maturation. While in Canada, earnings will matter more and more as investors focus on companies' ability to live up to their large market caps. We continue to believe that a basket of U.S. large-caps is the best way to invest in the fledgling U.S. market while investors need to be more selective in the Canadian market.